The moment Ramona Neckoway learned she had completed the requirements for her PhD, she immediately thought of the Access Program. “I would have struggled much more without them. It chokes me up to talk about it. University can be a challenging environment on many levels. With the help of Access, I acquired the academic confidence that I would take me into the future and accepted that I belonged at university. When I came to campus all those years ago, I was struggling personally and academically. 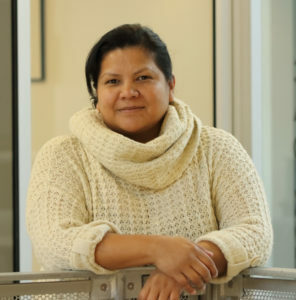 I am so grateful they helped me through my degree,” says the member of Nisichawayasihk Cree Nation in Northern Manitoba, who joined Access when she came to the U of M as an undergrad in 2002. Now, Neckoway is Assistant Professor and Program Chair of the Aboriginal and Northern Studies Program at University College of the North’s Thompson campus. She remembers when she first started university. The support of Access was like a weight off her shoulders. She continues to look at this issue in her academic work. With Access, a number of students have earned degrees in medicine, arts, social work, science, education, nursing, pharmacy, dentistry, medical rehabilitation, law, and more. Access students are supported with academic advising, personal counselling, a full-time Indigenous Unkan (Grandfather), a financial advisor, smaller classes, learning labs, tutoring hours, and connection to the Indigenous community as the program is located in Migizii Agamik (Bald Eagle Lodge) on the U of M’s Fort Garry campus in Winnipeg. Jesse McGregor, a Cree Indigenous U of M student from Grand Rapids, is the only student from his high school graduating class attending U of M with the Access Program. All Indigenous students should know about this opportunity, he says. “There is so much potential back home on our reserves. It’s not because they can’t do it. People are afraid of change. You get stuck. He encourages Indigenous residents of Manitoba to apply to the Access Program, and attend the University of Manitoba.